This discussion paper by Benjamin Tallis and Michal Šimečka, who are both senior researchers at the Institute of International Relations, provides a critical reflection on hybrid warfare –as both a concept and a practice– in the context of collective security in Europe, and discusses the roles of the institutions and policies of NATO, the EU, and the Member States. 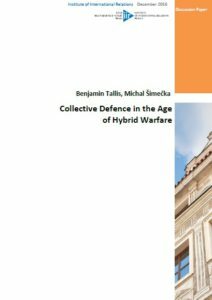 Over the past two and a half years, ‘hybrid warfare’ has turned from an academic fad into an article of conventional wisdom. Russia’s March 2014 annexation of Crimea and aggression in the Donbas – and, even more importantly, the lessons collectively inferred from the conflict by US and European policy-makers – have fashioned a new lens through which security in Europe, particularly the Eastern flank of NATO, came to be imagined and pursued. This is so despite the lack of either an agreed-upon definition or a consensus on the manifestations of hybrid warfare. Find the full discussion paper here.